Fixed star Capulus, M34 Persei, is a 5.5 magnitude star cluster in the sword hand of the Hero, Perseus Constellation. Morse says that the word Capulus means Handle, but Google Translate says it is Latin for Coffee. 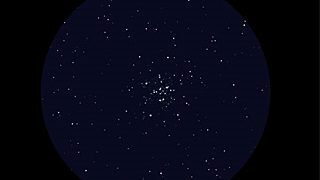 The cluster is just visible to the naked eye in very dark conditions, well away from city lights. Capulus, or Gyrus is a multiple star and a cluster. The second name merely describes the circular appearance but Capulus means a Handle, as they mark the sword hand of Perseus, which is why Ptolemy classed them as a Mars-Mercury item. Like most clusters they are traditionally malefic, associated with either murder or execution. Being in Taurus, those facts are specifically related to the neck, hanging or beheading. 2. Fixed Stars and Judicial Astrology, George Noonan, 1990, p.
3. The Living Stars, Dr. Eric Morse, 1988, p.130. 4. The Fixed Star Health and Behavior Imbalance, Ted George and Barbara Parker, 1985, p.21. I have Mars directly on Capulus ruling my natal horoscope from 12th house. It has been awful life full of ridiculi and lack of sense. Yet I have found that Gnani Yoga has explained my life ideals I have had my whole life up to this point. So… yet I had always been feeling Agnostic, it is also the star of spiritual blindness, but I have Mercury very well positioned in my natal chart and has always been interested in secret or occult. Great feedback Rale, thank you. Hi Jamie, Thank you, This was from your Saturn Retrograde article and I would request a reading please. My child fell sick on March 11, 2016. Her DOB is 20th Aug 2002, New Delhi, India, 5:30 PM or there abouts. I also started having some problem after few days. My DOB is 30th April 1975, Calcutta, India, 9:16 AM. Both our conditions are painful without a direct cure in sight. There is lot of panic and paranoia in our minds right now with high anxiety about how things will turn out to be, so was looking for an astrologer to shed some light as to when this will get over. Please help, an anxious mother. My name is Paromita,and my child’s name is Juhi. I think I answered your question on another post. Just guessing, maybe both suffered tragic death in each others arms once upon a time. I would be careful! With alcohol/ anger or posessiveniss.. check out the degree of descendant or anything opposite (asteroids)? The mc and ic… the spinal cord of your relationsship. It can indicate a spiritual spark between you both that can heal you both. Takes al the taurus values serious or it can end nasty. Its best to have a realistic view of eachother. note: While the Donald is busy playing with fire engines Mitch McConnell the majority leader of the Senate is busy messing with our healthcare so I found his birthday but time unknown: His Mars is conjunct Capulus which is conjunct Saturn and Uranus 72 degrees from Pluto in Leo on Regulas. Mitch is a Pisces and steals power and manipulation quietly and stealthily. It’s probably Mitch who is running the government behind the scenes and is one to watch. His birthday Feb. 20, 1942. Would the 72 degrees in this chart plus Mars square Pluto signify drive for power. Also, his Saturn and Uranus is conjunct Algol. Ive been in a turmoil few months, last year with a men who had mars conjunct algol.. like a cat im still licking my wounds.. The man was very abusive, alcoholic and apparently a drugaddict. It was hard sometimes standing my ground but i survived. Other family members involved had nessus conjunct my chiron. It squares my natal mc leo 22°… north node retrograde in cancer 15° 9th house.. valuable family lessons learned. Nn moved to 14° cancer and vertex 17° into 8th house. The man has sun cancer 22° (10th) mc 17° cancer moon (9th house) cancer 12°. Hillary and Trump both have a prominent Capulus?!!! Both holding the swords trying to chop each other heads off! Oh my my! Why am I not surprised by this. What a fight, who wins in the end and is left hold the head of Algol?